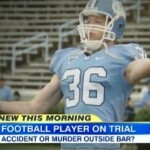 Dan was on Good Morning America, Wednesday, May 28th to discuss the murder trial of an ex-UNC football player, Kenan Gay. Gay is on trial for second-degree murder and is accused of dragging a man out of a bar in Charlotte, North Carolina and throwing him in front of a moving car in March 2012. Gay’s defense claims that he was only trying to protect his girlfriend- now wife- from harassment. Jury selection is underway and they will hear important facts, such as the victims blood alcohol level was 4 times over the legal limit. Says Dan, “The facts become so important here. On one hand you have the bar owner saying that he is literally taking this guy and throwing him into the street. That is not just protecting your girlfriend, that’s taking someone, removing him from the bar, walking him, in effect, into traffic, if the jury believes that, that’s murder. The defense says, no that’s not what happened, what happened is, that he’s simply trying to get this guy off his girlfriend, pushes him, the guy stumbles into the road and get hits by traffic… the surveillance camera is going to be very important as is the testimony of his now wife, she becomes crucial in this case.” Watch the full clip here.